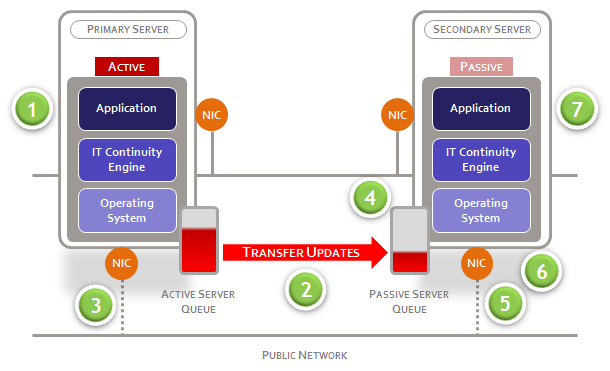 Neverfail Continuity Engine offers different procedures to change the role of Active and Passive servers. Built-in to Continuity Engine is the ability to switchover and failover. Switchovers are associated with protected applications and failovers are associated with protected servers. There are seven steps that document the switchover process. See the image below for an illustration of the steps. The switchover process is instigated either manually or automatically. In both cases the result is application control passes from an active to a passive server in a cluster. A managed switchover can be initiated manually from the Continuity Engine management interface. 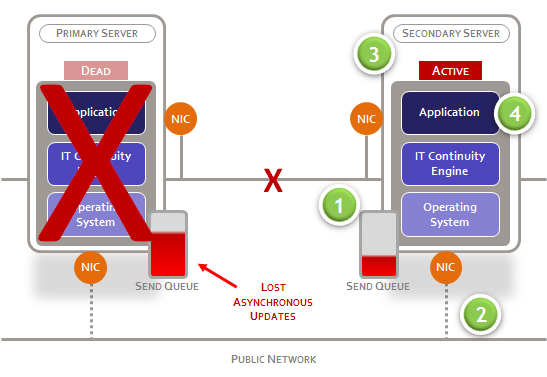 When a managed switchover is initiated, the running of protected applications is transferred from the Active server to a Passive server in the Cluster. The result is that the server roles are reversed. An automatic switchover, or auto-switchover, is triggered automatically if a protected application, which the system is monitoring, fails. An auto-switchover is different from a managed switchover in that although the server roles are changed, the Continuity Engine service is stopped on the previously Active server to allow the administrator to verify the integrity of the data on the newly Passive server. It also investigates the cause of the auto-switchover. Auto-switchovers are similar to failovers, except that they are initiated upon the failure of a monitored application. Once the cause for the auto-switchover is determined and corrected, the administrator can revert the server roles to their original state. The failover process can also be instigated either manually or automatically. There are four steps that document the failover process. See the image below for an illustration of the steps. When a Passive server detects that the Active server is no longer running or responding to its frequent “I’m alive” heartbeat messages, it automatically assumes the role of the Active server. A managed failover is similar to an automatic-failover in that the Passive server automatically determines that the Active server has failed, and can warn the IT administrator about the failure; but no failover occurs until the IT administrator chooses to trigger this operation manually.